Each RadPane provides built-in grouping functionality that allows you to place multiple panes inside a single container by organizing them in separate tab pages, similarly to the RadTabControl. Each RadPane can be grouped along with other RadPanes inside of a single container like it is shown in the snapshot below. In order to group your panes, you should use the Telerik.Windows.Controls.RadPaneGroup class. You can group panes during run-time by simply dragging the pane to the desired container. In order to group two or more panes, you should add them to the RadPaneGroup's Items collection like in the example below. In order to remove panes run-time you should either close the pane or remove the pane from the group via drag and drop. If you want to restrict the user not to close panes, take a look at the How to Disable the Close ("X") Button topic. The RadPaneGroup class exposes HideAllPanes method, which allows you to hide all visible panes belonging to the group. HideAllPanes method works only when all of the objects are constructed and added to the object tree. Which means that you should invoke it after the Loaded event of the RadDocking control has been fired. The RadPaneGroup class exposes ShowAllPanes method, which allows you to show all hidden panes belonging to the group. ShowAllPanes method works only when all of the objects are constructed and added to the object tree. Which means that you should invoke it after the Loaded event of the RadDocking control has been fired. If you need information about the events fired when showing and hiding panes, take a look at the Events topic. The RadPaneGroup class exposes PinAllPanes method, which allows you to pin all panes belonging to the group. PinAllPanes method works only when all of the objects are constructed and added to the object tree. Which means that you should invoke it after the Loaded event has been fired. The RadPaneGroup class exposes UnpinAllPanes method, which allows you to unpin all panes belonging to the group. UnpinAllPanes method works only when all of the objects are constructed and added to the object tree. Which means that you should invoke it after the Loaded event of the RadDocking control has been fired. If you need information about the events fired when pinning and unpining panes, take a look at the Events topic. The sizes of the RadPaneGroups that are not directly set in the RadDocking control, are set relatively. You can set relative size to a RadPaneGroup by setting the PropertionalStackPanel.RelativeSize attached property. By using this property you can proportionally divide the width or the hight occupied by two or more RadPaneGroups docked to the same position. For example, if you have two pane groups docked to the top, the first one should occupy 1/3 of the available width and the second - the remaining 2/3, you have to set this proportion (1:2) in their widths as it is shown in the code snippet below. Figure 1 illustrates the result. As you can see, the first pane group occupies 1/3 of the available width, while the second occupies the rest 2/3. The height specified is ignored because the groups have the same height as the RadSplitContainer in which they are hosted. 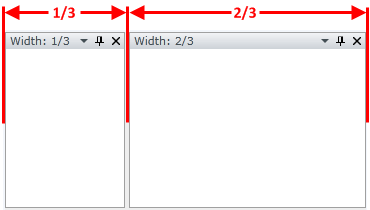 As can be seen on Figure 2, even when pane groups with fixed sizes are present, the remaining groups with proportional sizes will still resize accordingly. When the Orientation of the parent RadSplitContainer is set to Vertical, only the (Min/Max)Height properties are taken into account. Similarly, when the orientation is Horizontal, the container uses only the (Min/Max)Width attached properties. When both fixed and proportional sizes are set for a given group, the fixed size will take precedence. IsInDocumentHost - read-only boolean property. Returns whether the current RadPaneGroup is placed in DocumentHost. IsInToolWindow- read-only boolean property. Returns whether the current RadPaneGroup is in Tool Window. IsPaneHeaderVisible- read-only boolean property. Returns whether the pane's header is visible. SelectedPane- returns the currently selected pane within the group. EnumeratePanes()- returns IEnumeratble of RadPane objects. These are all the panes that currently belonging to the group. To learn how to style the RadPaneGroup in your applications take a look at the Styling the RadPaneGroup topic.